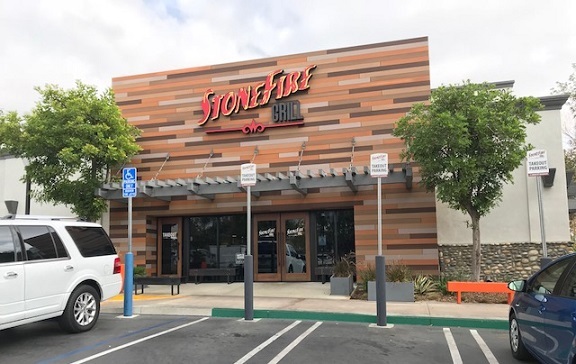 Stonefire Grill opened in June in the long-closed On the Border restaurant building at Terra Vista Town Center in Rancho Cucamonga. It’s one of nine current locations around Southern California, with the next-nearest one in Pasadena. A friend and I went in for lunch recently. It was bustling, that’s for sure. You order at what you might have expected to be a greeter station, at one of two registers. So you get a kind of McDonald’s or Panera vibe, except for the higher price points. They sell sandwiches, salads, barbecue, pizza, pasta and more. (See menu.) I’m a little suspicious of places with such a broad menu. Despite the lunchtime line, the staffer who took our orders was friendly. On the counter to tempt us were the largest brownies I’ve ever seen, square slabs about the size of a grilled cheese sandwich, but thicker. We demurred. After ordering, you fetch your drink, as well as plates and silverware, and find a seat in the sprawling dining room. Why take a plate? It turns out your food is delivered on a metal platter, like a pizza pan. 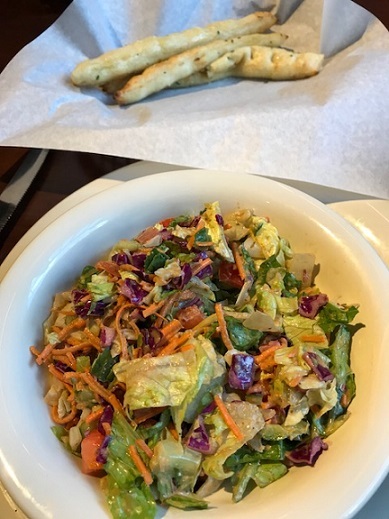 I got a “meal,” which comes with a salad or side, ordering mesquite BBQ tri-tip and baby back ribs, plus a salad ($16.60). My friend got the All American Burger ($7.50) and a bowl of chicken tortilla soup ($3.50), which he asked to be brought out at the same time as my salad. My salad arrived, and then when my platter arrived, he got his soup and burger at the same time (sigh). 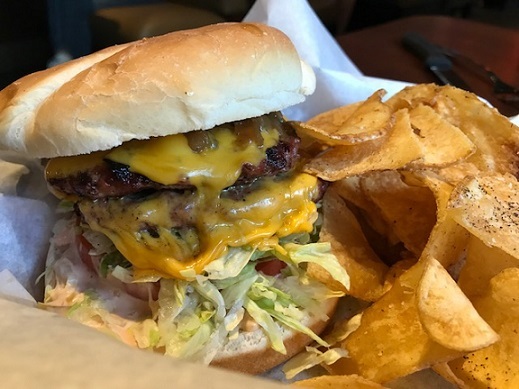 He said the soup had jack cheese, avocado and plenty of chicken, that his burger was better than fast food if not to a gourmet burger level and that the salt and pepper potato chips reminded him of the ones at the Buffalo Inn, “back when there was a Buffalo Inn” (another reason to sigh). 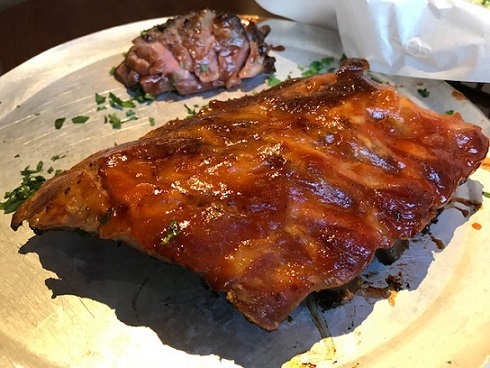 My ribs had a good bark, matching Lucille’s but not Famous Dave’s (or Bigg Dane and Beale’s), and the tri-tip, which I ordered medium rare, was soft and buttery. Oh, and at least with the meal, you get a free basket of breadsticks, which made me think I was at a higher-class Olive Garden. I’m a little mixed on the experience and probably would like the place better if there was table service instead of the DIY, cafeteria feel. But the food was a little above average. So, overall, not bad. 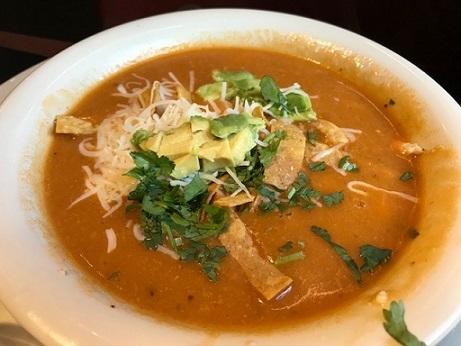 This entry was posted in Restaurants: Rancho Cucamonga and tagged Rancho Cucamonga, restaurants by David Allen. Bookmark the permalink.